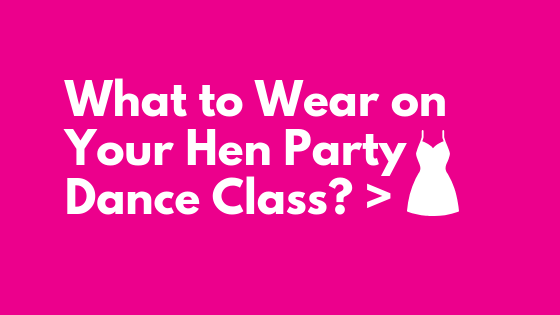 With so much to organise when planning a hen weekend, we thought we’d make things nice and easy, so have put together this handy little guide on What to Wear for a Hen Party Dance Class…. from footwear, to fancy dress, to what little extras to bring along, we’ve covered it all below! Share it with your bride tribe and get ready to boogie on down with us on your hen party dance experience! The Most Important Thing when deciding what to wear! The main thing when planning what to wear for your hen party dance class with us is to pick out something you can move comfortably in! Some groups opt for gym/dance gear, others like to get into the spirit of things with some hen party fancy dress, and some bride’s prefer to keep it a little more casual with clothes they’re going to stay in for the rest of the afternoon. Any of the above options are absolutely fine, as long as you can move comfortably, and aren’t in anything that will restrict your movement too much! Feeling uncomfortable in something too tight, worrying about your skirt/dress riding up, or ripping your gorgeous new jumpsuit you’ve spent is going to mean you can’t fully get into the spirit of things, so just make sure you can move nice and easily, so you can enjoy the dance class as much as possible and really get stuck in. You are MORE than welcome to get dressed up for your hen party dance class or to dress the bride up for your session! It’s a great way to really get everyone excited about the class, makes for some brilliant hen weekend photos, and makes the final routine look even better on video! (We’re always happy to record the final routine for you, just ask your instructor on the day, and they’ll be sure to leave time for it!). Get the legwarmers, lycra, and leotards out for an 80s Dance Masterclass, feel flapper fantastic with some Gatsby Inspired outfits for a Roaring 20’s Dance Experience, don the Union Jack Dress out the cupboard for a Spice Girls Dance Experience, or even embrace your sultry side with some stockings and feather boas for a Burlesque Masterclass….the possibilities are endless! If you don’t fancy going full blown fancy dress, some fun themed accessories can be a great idea for your hen party dance class! Some matching Hen Party T-Shirts, themed masks for your dance class, or even just some colour- co-ordinated make up or accessories can be a great addition to your dance class…and won’t break the hen party budget! Gym or dance wear is perfect for if you really want to get stuck in and fully make the most out of your dance class! It’s not essential, but can mean you can really get involved, smash out those Spice Girls High Kicks, and really dance the afternoon away on your hen weekend with no inhibition! We use a number of different venues for our hen party dance classes around the UK, which can vary from city to city! If you’re in a dance or gym studio for your dance class, trainers, pumps, dance shoes or bare feet are all absolutely fine (just socks alone are best to avoid unless you’ve got special grip socks, as you could end up slipping and sliding around the studio!). If you’re in a function room/bar venue, it’s best to avoid bare feet, but trainers, flat shoes, or dance shoes are all brilliant options. For classes like Burlesque, Salsa, or Strictly Come Dancing, a small heel can sometimes be useful, but do avoid big stilettos or platforms….there’s nothing worse than spending half your class worrying you’re going to take a tumble, or even worse, going over on your ankle half way through the session because of too high a heel! Deodorant/Baby Wipes! Especially handy in summer months, when it can get rather toasty. If you don’t have time in your afternoon to go back to your hen accommodation and change, or shower, a pack of baby wipes can be a great little tool to freshen up quickly post class! Leggings! Again, perfect for if you don’t have time to go back to your hen accommodation for a full outfit change. Just pop a cheap pair of leggings in your bag, and quickly change in and out of them before and after the class! Water! Bottled water is a great idea, just to make sure everyone is staying cool and hydrated during the session! Especially useful in those sunny summer months. The Final Details! It’s worth printing out the final confirmation for your hen party dance class, or screen shotting it on your phone, as it means you’ll definitely know exactly where to go and who to meet at the right time, and easily avoids any last-minute stresses! Your Dancing Shoes – Yes, it’s cheesy, but the most important thing to bring is some energy, excitement, and to be ready for a boogie! Whether you’re a seasoned pro, or have two left feet, our hen party dance classes are a guaranteed good time, and will hopefully provide you and your bride tribe with some unforgettable memories, laughs, and even maybe a new skill or two!